Here's a nice, free software tool for anyone that has multiple computers on their desk -- perhaps a desktop computer and a laptop or maybe one Windows computer and one Mac or Linux. The tool is called Synergy and it lets you easily use one keyboard and mouse with multiple computers. With this free tool, you can move your mouse from one computer screen to the other and the keyboard control follows. No need to clutter your desk with another keyboard and mouse. You can cut/paste from one computer to another and it will work across Windows, Mac and Linux. You need to download the software and install it on each of the computers. We currently use the latest stable version (v1.3.8) Be sure to follow the configuration directions whose link can be found on the Synergy wiki page. Setting up the computer name and screen relationships can be confusing at first, but for a simple two or three screen setup it is fairly straight forward. The screen relationship configuration allows for many screens in complex layouts. While running, Synergy minimizes to your taskbar tray (on windows) and has a few menu options from the minimized icon which are not usually used during normal operations except for Quit. You can copy something on one computer, move your mouse to the other computer and paste it on the other computer. If you like the tool, you might consider donating to the folks that created and maintain it. You can do that right from their web page. Program State: "Patched", "Insecure", "End-of-life", etc. Threat Rating for any "Insecure" or "End-of-life"
You can double clicking each row and get more information including some facts about the program and several links to Secunia's web page that describe the program vulnerabilities. In many cases PSI will provide a link to download and install the latest patched version of the insecure program. Secunia PSI provides valuable information about each of your installed programs and which ones should be upgraded or patched to better secure your computer from threats. Last week a customer called Merandex needing help with a possible virus. While he was browsing the web, his computer got infected with "scareware" which scares you into thinking your computer has a virus and strongly suggests you purchase specific software to remove it. Our customer tried to clean his computer with a popular antivirus program. While most of the scareware was gone, the computer was not back to normal. He still couldn't run any programs. Not good. That's when he called Merandex. To restore the damaged files, Merandex used corrective software specific to this kind of infection, then installed and ran a great malware detection and cleaning program called Malwarebytes. 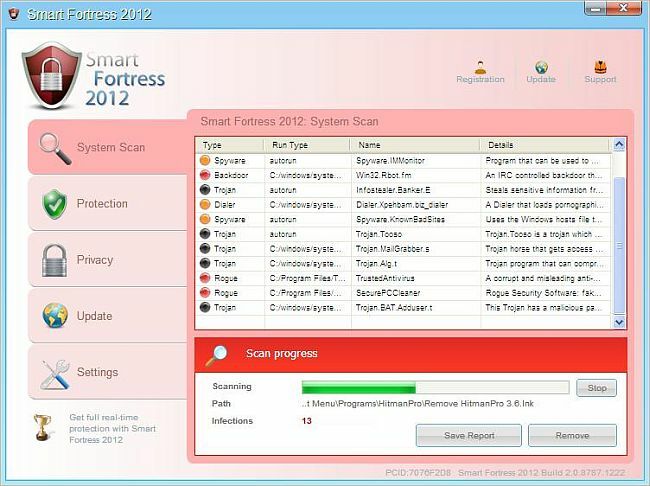 You can download the free version of Malwarebytes which provides on demand scanning or opt for the paid version which adds automatic scanning, updates and real time protection. Malewarebytes is NOT a replacement for antivirus software. For your protection, Merandex recommends both, along with a software or hardware firewall. We strongly recommend that virus removal be attempted only by a professional who knows what they are doing and has experience removing viruses. If done incorrectly, your computer could be severely damaged. This past weekend Merandex was an exhibitor at the New Jersey Veterinary Medical Association's 128th NJVMA Annual Meeting. (See the Merandex Facebook page for a picture of the table -- and "Like" us while you're there) While at the Animal Hall of Fame Awards, David chatted with Dr. Faith Krausman from Vet-On-Wheels. Among many of the technology topics they discussed, Dr. Krausman mentioned getting emails from friends with no subject and only a web page link as the message and wondered what they were. So this week's tip is about having strong passwords. Every so often you get and email from someone you know but without a subject and the only thing in the email is a link to a web page. Don't click the link. One explanation is that your friend's online email account has been hacked. If they had a weak password - perhaps a dictionary word, a hacker or spammer could have used a program to figure out their password and gained access to their email account. Once gaining access, they will send email to all the contacts. One way to create a password is to pick a sentance or phrase and use the first letter of each word. For example, using the phrase "I pledge allegiance to the flag of the United States of America" you can create: "IpattfotUSoA". You can add an exclamaiton point to the end, substitute a '1' for 'I', substitute '0' for 'o', etc. Another way to create a strong password is to use a password generator. There are many availible with a simple Google search. But no matter how you create a strong password, be sure to remember it or store it in a safe location. Every so often here at Merandex, we want to demo to a remote customer one of the custom applications we are working on. 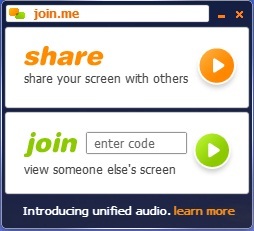 We came across a free screen sharing service called join.me that's easy to use. Once you are "broadcasting", you provide a 9 digit number to the people you would like to view your screen. All they have to do is go to http://join.me and enter the 9 digit number. However, they do need to have Flash Player on their computer or the permissions to have it installed. As the presenter, you can set up a conference call that is internet based or standard telephone based, text chat with participants, pause your screen broadcasting, view a list of participants, and even share control of the screen with a participant. The free version of Join.me allows up to 250 participants in one session. Join.me is powered by LogMeIn, a popular remote access tool. Last week, Merandex helped a customer become more efficient collecting information from their staff. Our customer has a group of employees that move through different job assignments over the course of a year. After each work cycle, they collect the employees' feedback on the role as well as the supervisors' feedback on the performance. To date, they have done this with paper surveys which needed to be distributed, filled out (with plenty of phone calls and email reminders), collected, and analyzed (usually by entering the data into a spreadsheet). To automate the process and increase productivity, we implemented a survey using an online survey tool. There are several out there each with their own benefits of price and features. We created two surveys - one for the employees and one for the supervisors, scheduled the surveys to start and be sent to the recipients at the end of each work cycle, scheduled a reminder email to be sent a few days into each survey cycle, and scheduled when each survey cycle would end. Now the coordinator spends her valuable time on other projects. When each survey closes, the coordinator views the results and downloads them for further analysis. We used the "Select" (pay for) version of Survey Monkey for this solution because it allowed us to schedule the survey actions ahead of time, track respondents and download the raw survey results. But as mentioned, there are several survey services out there. Some are free and have limitations. Of course, which is best for you depends on your needs. Merandex has automated many other processes for our customers using both existing and custom-created tools. Contact us for a free consultation and make technology work for your business. One of Merandex's customers recently asked how to create an email, but not have it sent until a certain date/time. Maybe they wanted to imply that they were working late into the night or wanted to use the email as a reminder for someone. Whatever the reason, here is how to create an email in Outlook 2010 but have it delayed until a certain date/time. In the new email window, Select the Options tab. Then select "Delay Delivery" If you do not have "Delay Delivery" then click on the little arrow in the bottom right corner of "More Options" If you don't have either of the above, then use File/Properties. In the Properties dialog box that opens, check "Do not deliver before:" and fill in a date and time. Click "Close" and complete your email message as usual. Hit the "Send" as usual. Once you've 'sent' a delayed message, what happens from there depends on your setup and how Outlook sends out emails. If you are an individual or small business, you may be using a POP or IMAP connection to your mail server. 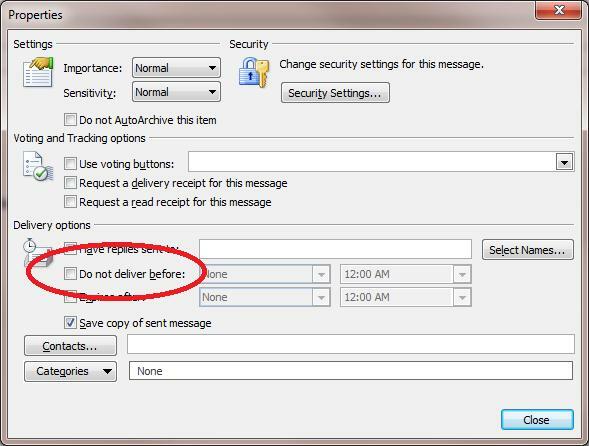 In this case, Outlook holds the delayed message in your Outbox until the date/time you selected for sending. But note, if Outlook is NOT running on your machine at the selected date/time, the message will NOT be sent and will remain in your outbox until Outlook is started. When you exit Outlook, it will warn you if there are any unsent email messages in your outbox - this includes delayed messages. If you are connected to an Exchange server, your delayed message is copied from your machine to the Exchange server. It will be held on the Exchange server until the selected date/time, when the server will send the message. As long as the Exchange server is running, the message will be sent at the selected date/time - Outlook on your machine does not need to be running. According to market research firm Gartner Group, Microsoft has approximately 94 percent of the office application market share, with a whopping 500 million users. Priced from $100 to $400 per user, this can get pricey for a small business. With 500 million users and customers sending and expecting MSOffice files, what can a small business do to reduce this expense? Writer: A word processor or desktop publisher. Impress: A multimedia presentation tool. Draw: A complex drawing tool. Math: A mathematical equation editor. But using only Open Office may provide a few challenges, especially for those who need to exchange complex MS Office files - perhaps with customers or partners. OpenOffice.org continues to address compatibility issues with each new release. However, a small business may want to keep a copy of the current MS Office around to deal with the occasional complex MSOffice file. Copyright © 2012 Merandex Technology Solutions, LLC. All Rights Reserved. Website created by: Merandex Technology Solutions, LLC.